US Ambassador, Mr Stephen Beecroft and Luxor Governor, Mr Mohamed Badr, participated in a groundbreaking ceremony on March 6 for the expansion of Luxor’s wastewater treatment plant. 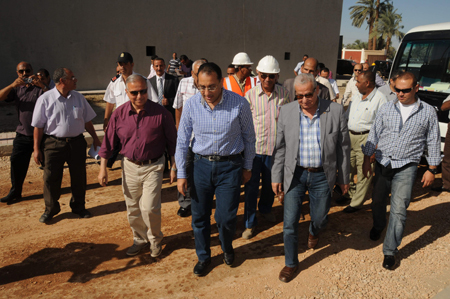 When complete, the expansion will nearly double the capacity of the system to provide wastewater treatment to residents of Luxor and El Bayadeya. Funded by the United States Agency for International Development (USAID) and carried out in partnership with the Luxor Potable Water and Sanitation Company, the expansion will provide improved wastewater treatment for Luxor and El Bayadeya to meet projected population growth for the next two decades. Since 1978, the U.S. government, through USAID, has invested nearly $30 billion in Egypt. Over $3.5 billion dollars has been used to help construct or upgrade water and wastewater facilities that serve more than 25 million Egyptians.